Pushing it a bit to meet our April promise of some new set reports, but as promised here is one which I hope you will all enjoy. Thanks to the newest member of our team Higuri from Japan for this wonderful report. As usual with any visit to Leavesden studios the day started early with the first point of call being reception for a full health and safety briefing. Once the necessary stuff was done we climbed into an on-set minibus and were off on a tour of a lifetime which took in the QWC campsite, the quadrangle inside Hogwarts where Ron accused Crookshanks of killing Scabbers and Fred and George dragged Harry through the snow in POA and the building housing the giant tank in which the underwater scenes were filmed. One over-awed young guest had real difficulty choosing which was his favourite part of the tour. He was heard over lunch to remark, “All sorts of amazing things happened. I’d always wanted to see the Great Hall and to sit on the Gryffindor bench and look up at the teacher’s table was like a dream come true. On the way to the Great Hall we saw a lady very gently putting a fluffy white ferret into a carrying case. She told us it was Draco Malfoy as Moody intended (ha ha). We also saw Hedwig and I couldn’t believe how beautiful she and the two other owls we passed were close up. Dodging under the giant fanged head of an enormous Dragon in the Creature shop was thrilling. I’m sure she was the Norwegian Ridgeback but our tour guide said he couldn’t possibly confirm that as he would then have to let her eat me. Even though I knew she was a model she was very scary because she was HUGE and filled the entire length of that part of the room.” A trip to the Gryffindor common room and a bounce on Harry Potter’s bed in the boys’ dorm were described as ‘fantastic’. The biggest surprise of the whole day had to be [as I stood shivering with excitement in the spooky place]. A very unwell looking Cedric Diggory came walking down to set. “Hi” he joked, “Sorry about my appearance. You’ve caught me on a dead day.” According to all reports, Robert Pattison was really warm and friendly and said how much he loved being part of the HP cast and how much he’d been welcomed into the HP family. The rest of the cast were equally friendly. According to their guests every single person was welcoming and courteous and made it seem as if nothing was too much trouble. As they went to lunch some of the younger cast including Matthew Lewis were playing football and invited one lucky visitor I believe to kick the ball about with them. So, there you have it. Nothing we didn’t know before, i.e. the cast and crew of HP rock and the GOF is going to be truly awesome but its a great new perspective on a day spent at the truly awe inspiring Leavesden studios. A day as an extra on HP4! This is a wonderful little report we've had from a young boy who spent the day filming with the entire guy's on HP4. It contains no real spoilers but it does give you a great insight as to the process of filming and descriptions of the action. My day started by being taken to Leavesden studios at 8am in the morning for my first day of filming. Id been to Leavesden before to visit, but never to be in a film, I was so excited. The scene I was going to be filming was shot right at the far end of the huge grounds of the Harry Potter studios and was the same building that was used to film some of the underwater scenes. To get there we had to drive through security, drive all the way up a massive runway, passing a Quidditch stand, a huge Privet drive and the Nightbus to name just a few things. Once at the far end there were all sorts of studio items outside. The Basilisk heads from the Chamber of Secrets, some knights from The Philosophers stone, so many great things, I wish I could have had one of these in my garden! Once on set I was taken to the dressing rooms where I had my own named peg waiting for me and an area for my things to go, this felt great being in the film. Then it was onto make-up and costume departments. This was awesome; I was to be in the Quidditch World cup. was to be seated next to Harry, Ron, Hermione, Mr. Weasley, Ginny, the twins and lots of others and we were all to cheer on our teams. Some of us were really dressed up in cool gear. Jesters hats, faces painted and Bulgarian and Irish Quidditch tops. Ginny who is so cool wore a huge hat, Fred had his face painted, while some of us had flags to wave and cheer at the top of our voices on our teams. I don't remember seeing ANY of the Malfoys and I didn't see an empty seat for Winky? maybe it will be different once the film is produced. What really amazed me during filming was the use of only one camera?! Or so it seemed. I learnt there were many more but to make sure all of us 'extra's didn't look at them during filming they are hidden while we cheered on our teams. I had to follow a very small light darting around on a blue screen in front of me which represented one of my Quidditch team players. It's weird but great to act knowing all the really cool backgrounds will be added in and it will look so different on film. it means about 10 minutes of possible footage they might use - I hope so !! filming but the food and people are lovely!! 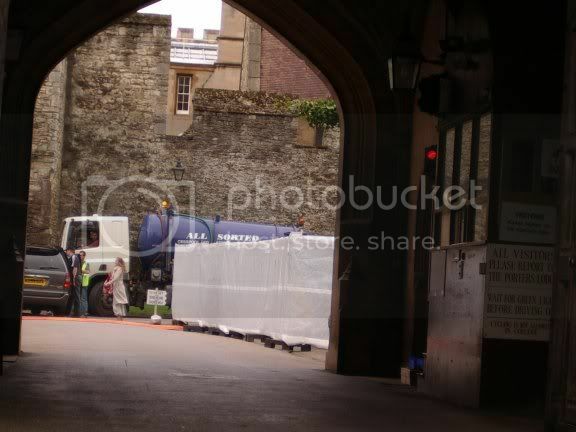 Yes folks, WB have been hard at it again, keeping a tight lid on the filming of the Goblet of Fire. What a set up this is, forget Virginia Water, forget the massive security surrounding the Oxford University scenes filmed late last year. This is a set to beat all others and security to match. One small area that WAS overlooked by Warner Bros. though, were coach trips of tourists travelling all around the UK on specially organised Harry Potter location holidays ! Mmmm....... OOPS! In the meantime, here's as much as we have been able to bring you over the past few days of filming and a gallery to boot ! With all of the filming taking place at night, sometimes 3pm to 4am and the VERY impressive security arrangements (which would include night vision goggles-to keep us at bay), it was impossible to get new pictures of anyone in action. We do hope to get a few shots today from our own Jess who's there right now hoping to meet some of the cast during breaks and we'll keep you posted! 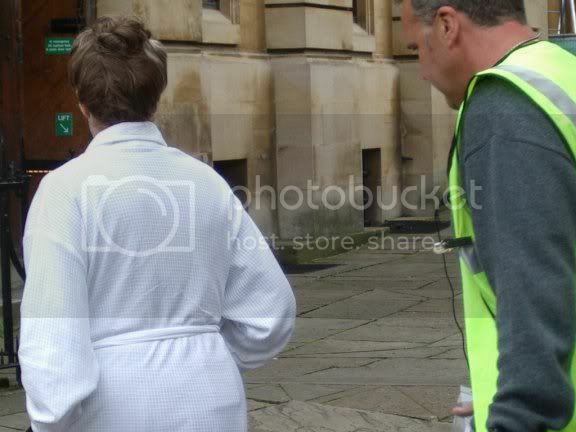 Thanks also to Kaye-Louise for giving us some of her own exclusive shots to use for this gallery. From approaching Black park, you are immediately hit full on with the scale of this shoot. There has to be 20 - 30 trailers taking up at least a third of the car park. These of course are for the actors, make up, refreshments etc. The walk to set is simply 10 minutes away, but situated behind a green screen which surrounds the whole area to provide a simple yet very effective shield for photographers and intruders alike. Filming right now (picture Hagrid asking Harry to meet him in his cabin for a surprise!) are night scenes with Hagrid, Harry, Bill, Madam Maxine & Co. Of course then, there are the Dragons ! Obviously the dragons will be CGI based (and no doubt brilliant at that), but as with the award winning Buckbeak scenes, there is the use of a prop Dragon which we tried so damn hard to get a shot of, too no avail. We can confirm its there and in one of the shots you can see part of it under wraps. the wall shot is the entrance to be used to the Dragon enclosure. The film is being shot with a lot 'darker tones' to the whole film. 1.5 million pounds for this location shoot, to get around 3 minutes of footage ? Thanks to Kaye for allowing us to use this exclusive location report. 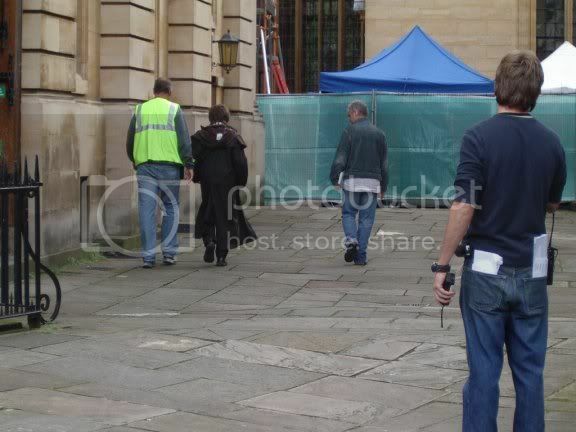 Its Monday 29th November, we have just got back from watching the filming for Goblet of Fire at Virginia Water. After watching the progress of the sets for the last four weeks, we arrived and walked to the sets all near the Roman Ruins. We arrived at about 2pm, about ¾ of the car park is now full of marquees, trailers and equipment lorries. When entering the car park first of all we saw Robbie Coltrane’s Silver trailer (Hagrid). 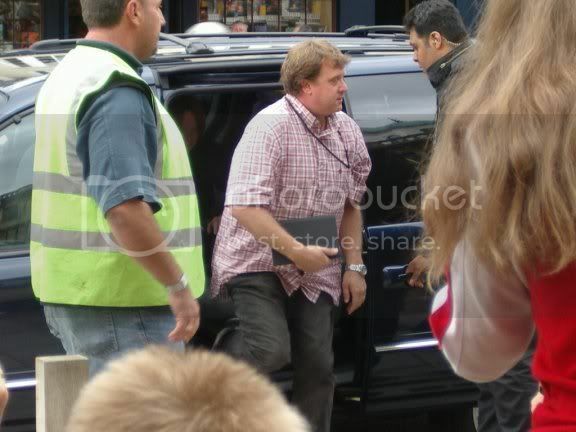 Then when we first got out of the car, we noticed Daniel Radcliff’s car and spoke to his driver, he’s a great guy, funny and really nice. So we knew that Dan was there today. Walking the quarter of mile around the lake to the sets, we could see that the security was very much tighter. The whole place was also very muddy now and they diverted us by foot through the woods. When we got to the first set they were filming by the lake. First of all we saw Barty Crouch (who was dressed as though he had stepped out of a Dickens novel), he was friendly and was looking at the crowd and liked the fans attention. We noticed that there was a remote control that someone was holding and expected to see some animatronics animal or puppet. After looking around we then saw Mad-Eye Moody (Brendan Gleesan, dressed similar to how Hagrid would be dressed and quickly realised that the remote control was for his Mad eye). He was in makeup and cloaked in security and although we could easily see his face, eye patch and eye there was so much security that it was impossible to get a clear photo of him. He didn’t really look at the fans at all and didn’t seem to be bothered that people were here to support him. He gave no interaction to the waiting crowd and didn’t even look or smile. We also saw Emma Watson (who is always so happy and friendly to the fans), Tom Felton who was dressed in Navy and had a woolly hat, and we walked directly past Dan without realising until it was too late. As we were desperate to get a photo of Mad-Eye Moody we didn’t go back to Dan who was signing a few autographs about one hundred yards away. He was on his own and with his chaperone; he looked very tired, sad even. It was a very cold day and maybe it was just that, or maybe he’s just starting to lose interest in the whole thing. There were three sets, the main one which has taken five weeks to build, was a Rope Pulley Ferry boat system leading from one side of the lake to the other, with two boats on each side. They had built a Boat Jetty on one side of the lake and we understand that in the movie these boats were bringing people across from the other side of the lake. The second set was another boat jetty, this had about five canoes, and a life buoy, and we didn’t see the filming of this one. The third filming was of a big crowd (about 100 extras) of Hogwarts school kids with Mad-Eye Moody walking in the middle of the crowd. We understand that from Tuesday and for the rest of the week that they will be filming near the waterfall in Virginia Waters. This time at the end of the day all of the Stars were ushered into their cars and their fans didn’t even get a look in. No other autographs were given. It’s such a shame, there are some really great Guys both cast and crew and there are others who feel that they are too important to even care that we have travelled an hour to go there with our kids. HP4U at Virginia Water Surrey, Nov 2004. Considering there were only, to my knowledge, 5 onlookers to the set, security has been tightened considerably from last year. Absolutely no chance of photographs was the common WB line, so in not wanting to upset anyone we left it alone. I did however try to capture some of the scenes and the backgrounds used to give you a general feel of what was happening, these images can be found below, ask if you wish to use them or at least give credit. What do you all want to know then? Dan looked great, wearing grey trousers and black hoody. I caught him walking back to the set, enough time to say 'hi'. Emma also, back in another pink top for Hermione? And finally Bonnie, wonderful as usual and always time for a two minute chat. I even managed a quick signature. Today's scene was some type of conversation between Dan, Emma & Bonnie, sat on a log type of creation right next to the lake, I could only really think it resembled a scene of contemplation for Harry, maybe at the end of the second task in GoF? Not sure on that as I was allowed only to watch for five or so minutes, but Iwas watching from two great positions, first about 20' away to the left of the filming, then after taking a bit of a detour I sat on a bench right in the middle of the action (if you can call it that) with the crew. I was hoping (as with last year) that the cast would go back to their trailers for lunch but everything this time was done 'on the move' because of the limited filming time and only 1 day to do it in. It's now dark in the UK by 5pm these days! Considering the amount of work that goes into one shot and one scene it's always amazing no matter how many times you witness it, the hundreds of crew, staff, people it takes to get all this prepared. I didn't see Mike Newell there, but I did watch the set being dressed. The whole stretch of pathway was prepared, extra leaves on the footpath, trees positioned correctly, lights and screens all set up using the guys doubles for the preparation work. If you have never visited Virginia Water, the Royal gardens are wonderful. This particular set was filmed between the famous waterfall and the ancient ruins, which may or may not feature in the background. Some rock-solid facts to bring you up to date with ALL that's happening on the various film sets of the Goblet of Fire. The Dragon scene IS being shot over the coming 2 weeks up in Bonny Scotland as reported by Wizard News. 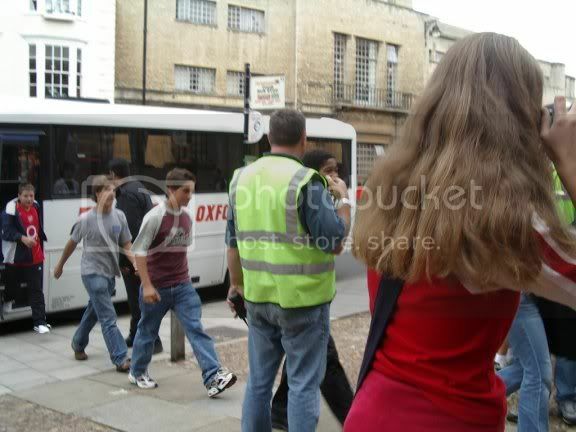 Unfortunately filming has finished now in Oxford apart from TOMORROW (Saturday 28th August), just head down to the bookstore at the bottom end of town!, who will be there I'm afraid I dont know, but its worth a try. There is also a strong rumour the 2nd unit crew will be back in a month or so for last minute extra's, there is no more main unit filming to be done. There are 2 more new location shoots planned for 2004, we will update HERE in plenty time for everyone to get along to them if you can. Despite the fact there was reportedly Fleet street 'paparazzi hanging out of windows, employing a helicopter ?, just to try and get a glimpse of Mad-Eye Moody, we were able to be there for the lunchtime trip of all the cast relatively well. We took plenty of pictures and will post them once our main camera is back with us as its being used elsewhere before we could download the images, in the meantime, here are a few shots of the location. There wasn't anytime to get autographs today as everyone were bustled in and out of the car's and buses in a flash that were waiting for them. Rupert as always, is the perfect gent, always finding time to say hello, no-matter what the hurry. 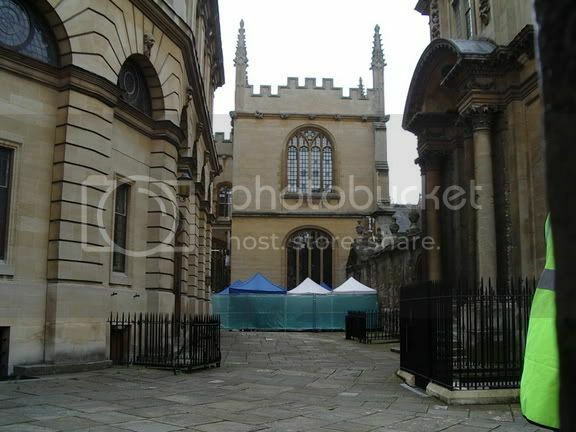 What we know of the Oxford shoot is amazing!. 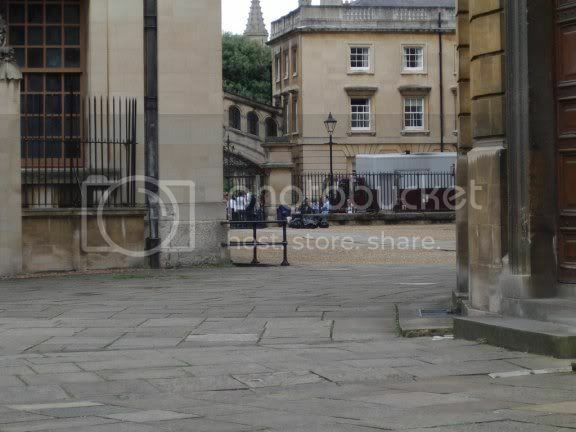 The town was used for the filming of The Philosophers Stone, the courtyard of the New College indeed is where Hedwig flew in many of his scenes. But for 2004, Filming has been underway for...........ready for it!, Malfoy's clash with Moody and his transformation into the Ferret, the Defence against the Darks arts class scenes have also just been filmed, we don't know if the spider scene was shot as we were unable to see any filming but what we did see, in Ron Weasley's own words was 'bloody brilliant'. There is the most amazing gramophone being used on set, absolutely huge, where this is situated on set we don't know yet. There is a monkey here for filming, why ?, again, we couldn't find out, but remember you saw it here first!. Most of the main cast were here, Dame Maggie Smith, all the main cast children, Michael Gambon, of course Brendan Gleeson and many others. We can confirm also that the stadium HAS already been built on set at Leavesden for the Tri-Wizard tournament, most is in the hanger, some is still on the runway, its huge! As everything we've seen and heard from Chris is true (yup! Sorry folks, unfortunately there's lots we've had to keep out on reporting), we know what he says here is correct. And we thank him for his reporting to us. ;) Cheers Chris! Also heard (yes heard cause I don't read rubbish) that some fans have critisized others' reports coming into here. To those? Get a life! I do VERY little editing, as that takes away I believe. The one that was previously critisized was from a young boy, and I didn't consider them 'His MISTAKES', but his love for the HP world. And it was His report, so I didn't touch it. A super cool EXCLUSIVE report from filming, this time from The Goblet of Fire. This exclusive to HP4U given to us by one of our readers - Thanks Maria. **We will update HERE periodically with news of filming, location shoots and as many pictures as possible. The set is the most amazing thing I've EVER seen. All the seats are raised in tiers, just like in the book and its all been made in a huge octagonal shape. The most amazing thing is the use of fire - real fire. There is a huge fireball lit in each corner and is used for the effect of the flames - its awesome and made to look from the 360 degree camera as though its in Dumbledore's memory (which of course it is). Wow, I wish you could all get a picture of it, words cannot describe the effect.Made of course to look as though Harry has gone back in time, imagine Dickens and all those old bookshops, or Ollivanders, stacked full of items, this is the effect of the court, full, stacked with mountains of papers!.The artwork and set decoration of the court room is immense, it looks ancient, Byzantium times, the old ruined golden paintings and the realism was great. But, THE greatest prop was the "cage" Karakov has to stand in, so much like a torture chamber, guards standing around him, prodding and poking him, turning head screws when he wouldn't give up the names of the other Death Eaters. These are guards from Azkaban and NOT Dementors as with the original book, police type figures for the escorting of Prisoners. The cage is something like a medieval cage evil men were put in alive to rot. He doesn't actually go into the cage or come in with it, instead, he comes up from the ground, shoots up into it!. There's two of these police type around him, to wind the screws in harder, he cannot move a centimetre !, they stand either side, to torture him and prod him! they are dressed in black, army style, almost like the old German Gestapo. They have a big silver badge that reads, ministry of magic, police, with a weird looking creature pictured.